The bible of all fundamental algorithms and the work that taught many of today’s software developers most of what they know about computer programming. Countless readers have spoken about the profound personal influence of Knuth’s work. Scientists have marveled at the beauty and elegance of his analysis, while ordinary programmers have successfully applied his “cookbook” solutions to their day-to-day problems. 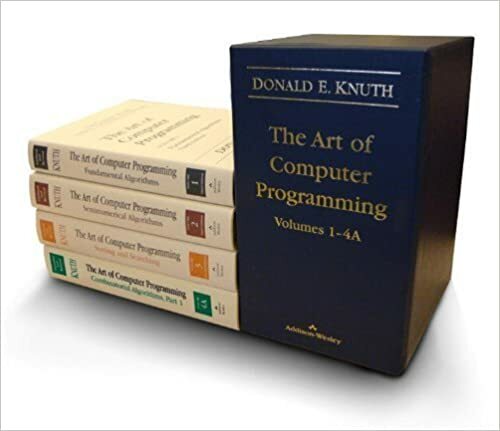 All have admired Knuth for the breadth, clarity, accuracy, and good humor found in his books. I can’t begin to tell you how many pleasurable hours of study and recreation they have afforded me! I have pored over them in cars, restaurants, at work, at home… and even at a Little League game when my son wasn’t in the line-up. Primarily written as a reference, some people have nevertheless found it possible and interesting to read each volume from beginning to end. A programmer in China even compared the experience to reading a poem. If you think you’re a really good programmer… read [Knuth’s] Art of Computer Programming… You should definitely send me a résumé if you can read the whole thing. Whatever your background, if you need to do any serious computer programming, you will find your own good reason to make each volume in this series a readily accessible part of your scholarly or professional library. It’s always a pleasure when a problem is hard enough that you have to get the Knuths off the shelf. I find that merely opening one has a very useful terrorizing effect on computers. In describing the new fourth volume, one reviewer listed the qualities that distinguish all of Knuth’s work. [In sum:] detailed coverage of the basics, illustrated with well-chosen examples; occasional forays into more esoteric topics and problems at the frontiers of research; impeccable writing peppered with occasional bits of humor; extensive collections of exercises, all with solutions or helpful hints; a careful attention to history; implementations of many of the algorithms in his classic step-by-step form. These four books comprise what easily could be the most important set of information on any serious programmer’s bookshelf.